My country is torturing itself with a feud over religion. I feel sorrow for my Christian friends who again must suffer the spectacle of their Christian god being evicted from the government institutions of the United States. This time, again, the battle is over the Pledge of Allegiance as recited in the public schools. Though not a Christian in any sense, I neither mock the faith nor regard it as irrelevant in the modern age. Rather, I appreciate its central and necessary function in American democracy. You will never understand the role of a John Witherspoon in the Declaration of Independence without reference to it. And stop and think, fellow free-thinkers and pagans and non-Christians: Would you replace the mosaic of American Christianity with another faith? Which one? Where would you find one more inclined to steer its adherents toward public virtue, love of humankind, humility, tolerance, optimism, and non-violence? We children of the skeptical 20th century continually are dismayed to learn that the Founders held one opinion in private and another in public. They all knew this about one another. They were not like we expect our politicians to be, hauling all their personal opinions and private faiths into public office as though what they thought about God or no-God ought to be the nation's governing principle. They were more or less deists, by modern views, who tended to be two-faced about public religion, except to them it wasn't a deception so much as a recognition that they were leaders by virtuous example. What views they held themselves they did not urge on the nation. Instead, they sought to encourage the best of the people's tendencies. It's an elitist practice long since lost in America, and any politician we catch nowadays at it we ride into the ground as a hypocrite. Jefferson certainly wasn't much different than Tom Paine in his religious views, but Paine published his and Jefferson mostly kept his private and went out of his way to pay respect to Christian views he did not share. That, as much as anything, may be why Paine, who did as much as anyone to set America free, generally is excluded from the pantheon of the Founders. They were, as Gordon Wood says in "Revolutionary Characters" (the best book this year on the Founders) "self-fashioned performers in the theater of life." Theirs was not character as we today are apt to understand it, as the inner personality that contains hidden contradictions and flaws. (This present-day view of character is what leads to the current bashing of the founders). Instead their idea of character was the outer life, the public person trying to show the world that he was living up to the values and duties that the best of the culture imposed on him. The founders were integrally connected to the society and never saw themselves as standing apart from the world in critical or scholarly isolation. Unlike intellectuals today, they had no sense of being in an adversarial relationship to the culture. Like the liberal Founders, who did not practice the Christian faith or believe in its theology, I would do nothing to discourage the American people from their Christianity. Even Jefferson, the deist/Unitarian who so riled the pious Christians of his day, understood this. One Sunday morning, as president, he was walking to church service, prayer book in hand, when a friend accosted him and said, "You going to church Mr. J. You do not believe a word in it." [Americans were more familiar with their presidents then]. Jefferson replied, "no nation has ever yet existed or been governed without religion. Nor can be. The Christian religion is the best religion that has been given to man and I as chief Magistrate of this nation am bound to give it the sanction of my example. Good morning Sir." George Washington, the practical plantation-manager among the learned Founders, often spoke about the political importance of religion. He did so in his "Farewell Address" (based on a draft by Hamilton), where he named it along with education and public credit as things productive of "public felicity." He was not talking about government-sponsored religion. He was talking about the people and their faiths. Plural. When it came to the government, Washington was no less a separationist than Madison and Jefferson. He had had first-hand experience with the problem -- or rather the twin problems -- of the people failing to accommodate one another's beliefs and the government's heavy-handed impositions. As commander in chief during the Revolution, Washington outlawed New England regiments' "Pope's Day" buffoonery because it offended his Catholic soldiers. Politically correct? He had a war to win and he needed everyone. In 1777 he opposed a congressional plan to appoint brigade chaplains in the Continental Army. "Among many other weighty objections to the Measure," he wrote to John Hancock (then president of Congress), "it has been suggested, that it has a tendency to introduce religious disputes into the Army, which above all things should be avoided, and in many instances would compel men to a mode of Worship which they do not profess." America could survive without its Pledge of Allegiance, without its flag, without its public schools. But not without its public virtues, which are driven by its religious sensibilities. Madison used to say that such things could be superfluous to a "nation of philosophers" who were motivated by "the voice of an enlightened reason." Nobody in Philadelphia in 1787 had any illusion that they were living in such a nation. All they had to do was walk a few blocks up to Market Street for evidence. This concept of virtue was crucially important, and the Founders wrote of it often. But they defined it differently than we do. To them, it didn't mean not drinking too much or sleeping around (though certainly they'd discourage these things), but, as their favorite political writer, Montesquieu, put it, virtue in a republic means "the love of the laws of our country" and "a constant preference of public to private interest." Just one example: When my wife and I recently went looking for a place to donate our mite to help hurricane survivors in the Gulf, we pretty much knew it was going to be a church charity of some sort. A pagan/freethinking household, we never set foot in a church except as tourists. We ended up giving mostly to the Mennonites. [You can be sure they're not going to go out and blow half of it on Hummers and martini lunches for their executives.] This didn't bother us at all. Maybe someday there'll be an Agnostic World Disaster Relief Fund. Maybe. But God does not belong in government itself. Rather, religion serves as the counterbalance to the popular liberties the government protects and is forbidden to touch. And it serves as a counterbalance to the competitive essence of our social system. At the same time that the law permits the American people to do everything, religion prevents them from conceiving everything and forbids them to dare everything. Jefferson, Rousseau, Voltaire, de Tocqueville, even Washington saw the situation more plainly than we do. Today, in media-molded America, we tend to experience only thuggish religion -- in which category I include secular fundamentalism and evangelical atheism. Such a view blinds us to the Enlightenment, and to the American Founders who were its students. We moderns tend to try either to reassert the full grip of traditional Western religions. Or else we sweep them away as the root of all modern evils -- as though religion was the apple in the Garden instead of a set of imperfect channels for deep, dark human urges. Religions are structures which draw destructive internal poisons and cure them, mostly, into constructive and calming rituals. Only a fool would think we can dispense with any such structure when Cambodia still reeks of corpses and we are only a few geological ticks out of the Ice Age. The American Founders had the confidence of believing Western religion generally was on a firm foundation and sustained by the evidence of nature. We live on the other side of that confidence, when the receding tide has eroded the Bible as science and as history. The secular eruptions of the 20th century exposed the primeval rock Christianity was built upon, and stripped off centuries of sand to show us the furious human urges that Western religions were created to control. We who survived the 20th century (hundreds of millions didn't who could have) looked down instead on the bare foundation under the cathedral: the chthonic rituals of the ancients. People who memorize the Voltaire quip about God often don't know the context of it: "I want my lawyer, my tailor, my servants, even my wife to believe in God, because it means that I shall be cheated and robbed and cuckolded less often. ... If God did not exist, it would be necessary to invent him." Most of the leading lights of the Enlightenment, though they stripped the cloak of reason from belief, generally didn't flay the naked skin of it. The notion and necessity of "civil religion" (Rousseau's term) is as central to them as is their loathing of pious superstitions and holy bigotry. Why did the Founders omit God from the Constitution? Because they believed religion to be rooted in man's nature, and to be flourishing in the American people. They did not have to build religion into the Constitution any more than they had to build Independence Hall before they met in it. Because it is no business of government to promote God. True faith has wellsprings in the home. The Scandinavian nations all have official, government-supported churches. And the citizens there are among the most secular in the world. The religions that received the most governmental support in early America -- the Church of England in Virginia and the Congregational church in New England -- are among the least flourishing in the country today. The Amish, among whom I live, are people of deep piety; they run their own school system, according to their own model. And they do not teach anything about religion and God in the classroom. That is the job of the parents and the preachers. And to the Enlightenment sensibilities of the Founders, to make religion the direct object of government "would be counterproductive, undermining the natural impulses that gave birth to them and kept them alive" [Gertrude Himmelfarb]. To put all in one place -- the government and the religion, is to unbalance this, and it is religion that will be most corrupted. Part of the problem here is that the Founders also did not conceive or make provision for a national system of public education. This, like religion, they left to the people, or to the states. I am sorry to see so many Christians aggrieved by this court decision over the Pledge. But the ruling is correct, both constitutionally and spiritually. By now, most people familiar with the case know the "under God" was inserted into the pledge a half century after it was written. The error is not in removing it; the error was made in 1954. We are correcting it now. 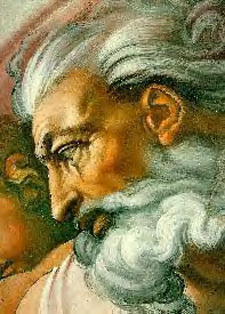 The blame, if any, resides not with the judges, but with those who insist on setting up their particular statue of the Christian god in the political edifice of the nation, where it does not belong. I cannot but think some of them do this pugnaciously, knowing politicians will be too craven to follow the constitution and thus enrage their constituents, knowing the courts eventually will have to do it, and the sight of God carted out of the public schools or the courthouse will create the impression of religious persecution. Sadly, this narrative seems to suit some people. � September 15, 2005 Douglas Harper Moe: "Say, what's a good word for scrutiny?" Shemp: "uh ... SCRUTINY!"